Since he was drafted in 2009, many have been praising the bat of Wil Myers. One of the top young players in baseball, the high-profile prospect is intended to be a cornerstone for years to come with the Tampa Bay Rays. Not surprisingly, Wil Myers cards are going along for the ride, putting up strong numbers already. Shop for Wil Myers cards on eBay. Drafted by the Royals, Myers was the key piece in a blockbuster trade that saw him head to Tampa before the 2013 season. After starting the season with 14 home runs in 64 games with the Durham Bulls, the outfielder got called up to the Rays in mid-June. Less than a week later, he notched his first MLB home run in style -- a grand slam versus CC Sabathia and the New York Yankees. Myers finished his rookie campaign with 13 home runs in 88 games. He also had 53 runs batted in and a solid .293 batting average, which was good enough to be named the American League Rookie of the Year. Wil Myers has rookies in several 2013 products. 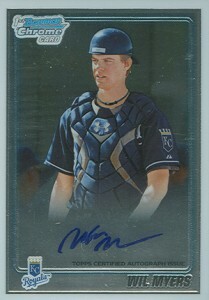 There are also plenty Wil Myers cards from earlier years, including several popular autographs. His first major cards came in 2009 Donruss Elite Extra Edition. He appeared in a couple of Bowman products in 2010, including his first MLB autographs. If you're looking for some more reasonably priced autographs and not as concerned about overall value, 2011 ITG Heroes & Prospects Baseball has several Wil Myers cards. Stay tuned as more Wil Myers rookie cards are released. We'll add to this list until every 2013 set is out and it's complete. Click on the card names or images to shop for singles on eBay. The Chrome stock gives this card a more upscale feel compared to other basic Wil Myers rookie cards. While it doesn't have nearly the same flash as his 2010 Bowman Chrome Prospects Autograph, it's a solid choice for the budget-conscious collectors. Simple and affordable, this is one of the outfielder's cheapest rookie cards. While the photo is interesting, it's also the same one that's used on his 2013 Topps Chrome card. 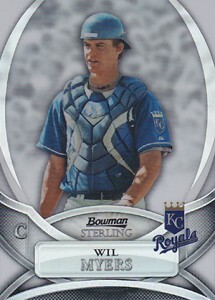 Featuring a dark, futuristic design, the main draw of the 2013 Bowman Sterling card is its rarity. Packs are pricey, driven primarily by autographs. This makes for a lot fewer base cards on the secondary market. Expect to pay a bit of a premium because of this, even without a serial number. Joining Bowman Chrome, Topps Chrome and Topps Finest, the landscape for chromium-style cards is becoming increasingly crowded. 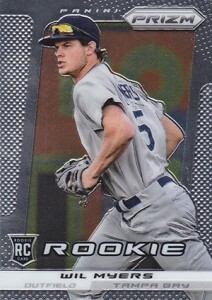 Panini does a great job of masking their lack of MLB trademarks with the 2013 Panini Prizm Wil Myers rookie card. The sunglasses hide any logos on his hat while the twisted pose naturally obscures the front of his jersey. Besides the base version, the card comes in several colored Prizm parallels. He also has an autograph in the set. Pinnacle is a name known primarily to collectors from the 1990s. Panini brought it back as a low-end product. 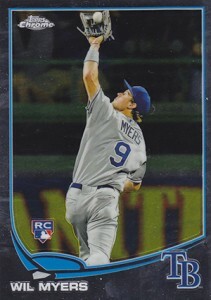 Boasting a design that focuses on the color black, it's one of the cheapest Wil Myers rookie cards. 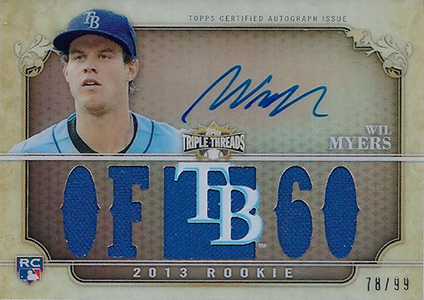 If you're looking for a reasonably priced Wil Myers autograph that carries the rookie card designation, this is it. Numbered to 500, it's rare but not terribly so. The drawback is the sticker does stand out on the chromium design. Also, some collectors balk at the lack of logos. 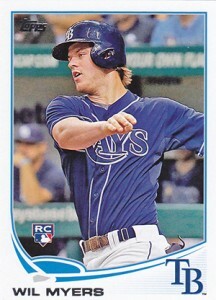 Over time, the 2013 Topps Update Series Wil Myers will likely get more attention than prices reflect. It's one of his cheaper rookie cards, but as a part of the flagship Topps line, it will likely be recycled in various sets for years to come. That won't make it any more valuable, but it will be more identifiable. It's worth noting that Myers also has a Rookie Debut subset card in 2013 Topps Update Series that isn't an official rookie card. As far as photography goes, this is one of the more interesting Wil Myers rookie cards. Known more for his bat than his fielding, the shot shows the youngster making a nice grab. Myers also has a reasonably priced autographed insert in the product. 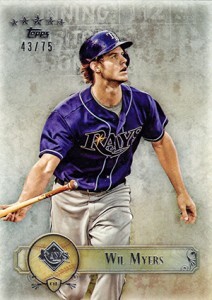 If you like chromium and wilder designs, the 2013 Finest Wil Myers might be your best choice. The look isn't for everyone, but it does have its share of fans. While the base version is extremely affordable, there are also several Refractor parallels. 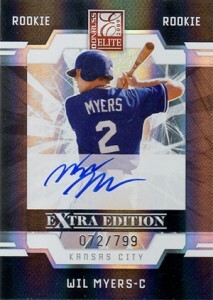 Myers also has an on-card autograph in the release. 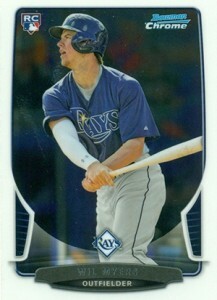 Numbered to 75, this is the rarest Wil Myers rookie card. However, the lack of signature keeps prices in check as a lot of collectors go after the set's hits. Over time, the rarity of the base cards could become more appreciated and this could change. This card is part of Topps' online-exclusive factory set. With a bigger print run than 2012's 1,000 sets, prices have been more in check. With a lot of sets staying together, singles could get a little tougher to find. But, overall, supply shouldn't be a major issue. 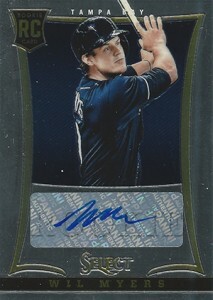 There's plenty to like about the first Wil Myers autographed rookie card. It has the trifecta of an on-card signature, memorabilia swatch and low numbering. 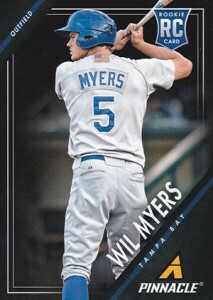 With just 99 copies of the base version to go around, this is one of the top Wil Myers cards to hold official rookie card status. Myers figures prominently in the high-end release. 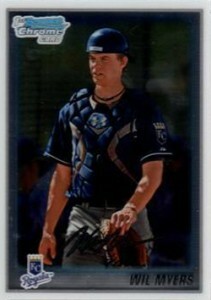 2009 Donruss Elite Extra Edition offers the first major Wil Myers card. The card is cheaper than the 2010 Bowman Chrome Wil Myers autograph despite an on-card signature, serial numbering and the fact that it came out first. For those not concerned about jerseys and logos, this shouldn't be a bad thing. 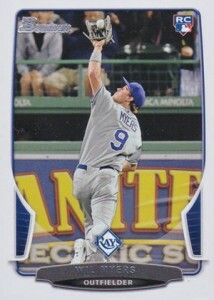 When it comes to key Wil Myers cards, this is it. The 2010 Bowman Chrome Wil Myers autograph is widely considered as his best card. It should maintain this status even as his official rookie cards arrive. A player's first Bowman Chrome autograph is often immensely popular as they're often the first to picture a players in a MLB uniform. Besides the basic version, there are several Refractor parallels that are also highly coveted. If the 2010 Bowman Chrome autograph is out of your price range, there is also the much more affordable basic Bowman Chrome card. Like the signed version, Refractor parallels add to the total number of cards, giving collectors an added element of chase. The 2010 Bowman Sterling Wil Myers sits in between the basic Chrome and Chrome Autograph. Numbered to 199, it's also got a high-end look and feel complete with Refractor card stock. 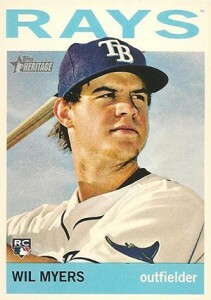 2011 Topps Heritage Minors #225- Wil Myers SP Rookie Card! PSA Gem Mint 10! 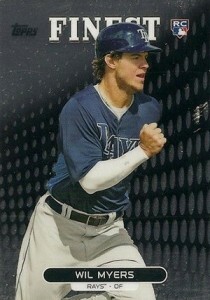 2011 Topps Heritage Minors #6 - Wil Myers SP Rookie Card! PSA Gem Mint 10! Dan Myers � He is referring to the grading. The card is graded a 10 by PSA. POP 1 implies there is only one card that has that grading in the PSA database. So there are actually 150 of those cards, but only one with a perfect 10 grading by PSA. Is there a reason why 2013 Topps A & G cards aren’t listed here? Chris � He only has an autograph insert in the set and not a base card. 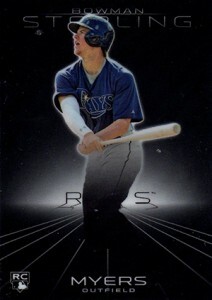 Is there any reason the 2013 superfractor bowmen platinum wil myers rookie card not listed??? I can’t find it anyplace? This is a list of rookie cards from base sets. The Superfractor is a parallel/insert.